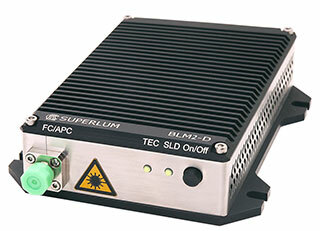 BLM2-D-series Miniature Broadband Light Source Modules with Extended Bandwidth are powerful and very broadband light sources based on a combination of two SLDs with slightly different center wavelengths. A built-in, stable and reliable digital dual-channel SLD current and temperature controller allows the switching of SLDs on and off either by a pushbutton, or externally by TTL, or from a PC via an RS-232 port. BLM2-D sources ensure quick and simple installation on the modular level and stable and reliable operation. Main optical parameters of standard BLM2-D light source modules are presented in the table below. Standard models produce broadband emission in 780 – 920 nm spectral band, however the flexible design of the light source and a great number of different SLD modules available for integration allow a lot of customized light sources to be designed. The optical spectrum and the coherence function can be viewed as a web page (HTML) or downloaded in PDF format. Housing dimensions (W × D × H): 100 × 120 × 31 mm (3.94 × 4.72 × 1.22 inches). +5 V DC, 3.5 A (max). Download Technical Product Specification in PDF format (210 KB) .